It's hard to believe that the Burj Khalifa in Dubai has been defending the record for being the Worlds tallest tower, for more than 7 years now! Although I must have seen it several hundred times, it makes it very hard for me, not to frame a few images whenever I have the nr 1 symbol of Dubai in sight. Such was the case when I was doing some street photography with the new 23mm f2 lens a few days ago in and around Dubai Mall! The image below consists of 7 handheld frames, shot while waiting for the daily fountain show (twice per hour after sunset) just below the tower. Over the years the lighting system has evolved quite a bit and now consists of a very high- end color light system which can project pretty much whatever is needed. The system holds a total of 70.000 LED light bulbs which are connected with 55000 meter of electrical cabling. Please make sure to click on the image above for the best viewing experience as the wide image shows up small here. More of my images of the Burj Khalifa can be found here. The contrast between the rich and poor in Dubai, is something that might not be obvious for a tourist that stays only a week in a luxury beach front hotel, but it does however become clear when one delves a bit deeper in the society of the city and the Emirates as a country. To me this is what makes Dubai such an interesting and diverse place to live in; a city where people from more than 100 different countries, live together in relative peace and harmony. In my Street Photography in Dubai, I often try and capture the contrast between the rich and poor. This was the case when I saw a Pakistani construction worker pass next to a mural in Dubai Marina; one of the more trendy areas of the city. 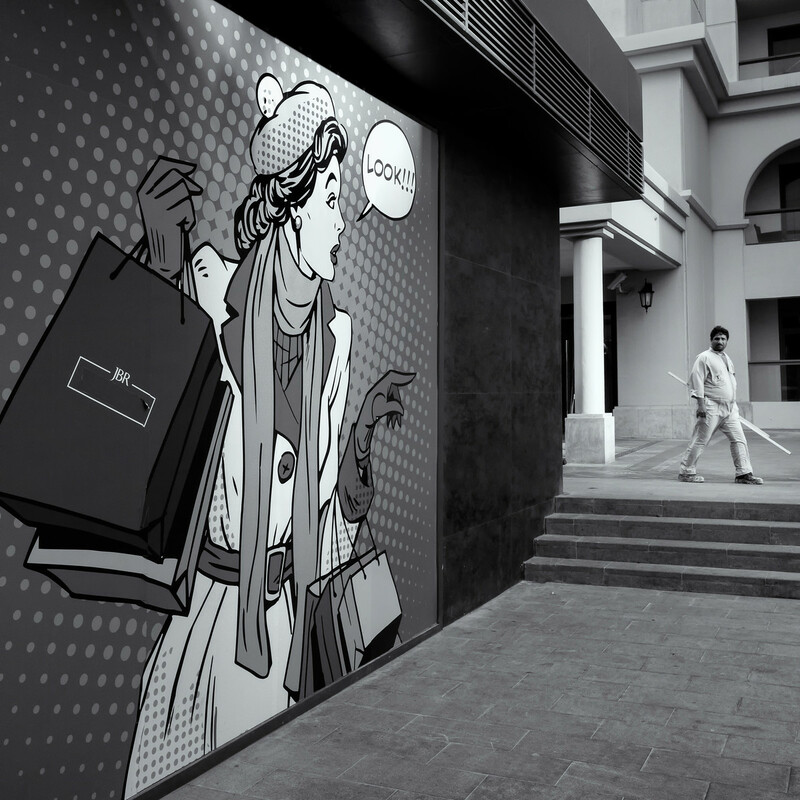 The markup balloon, "Look" next to a painting of lady that comes back from a big shopping trip, gives the image even more interest! While my preferred two lenses for Street Photography are the brand-new 23mm f2 and the 35mm f2, I was shooting some Architectural work at the time with my XF10-24 lens, when I was confronted with the scene above. I personally find that Dubai is very much a "Colour" Street Photography city; but I did find that the image above works better in Black and White as it accentuates the whole "contrast" theme ever better. 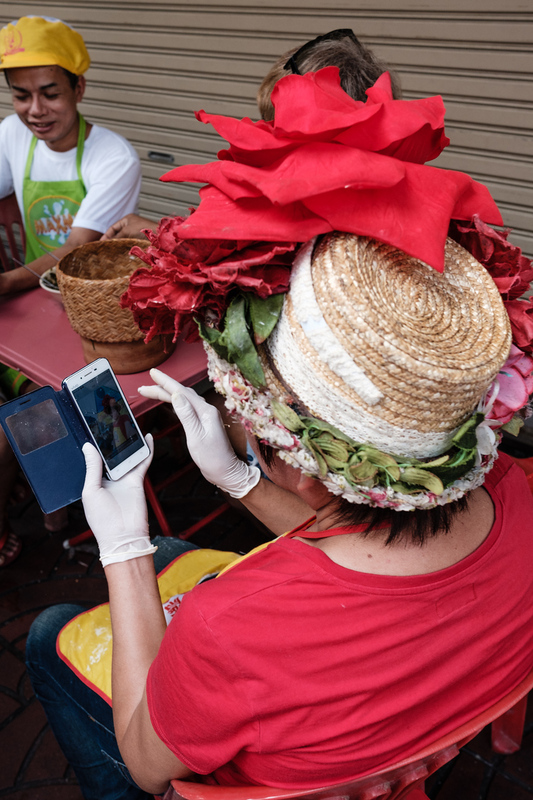 Those of you interested in Street Photography in Dubai, have a listen to my appearance in Valerie Jardin's Street Focus podcast (link here). Over the years my Street Photography has grown into a more substantial body of work. 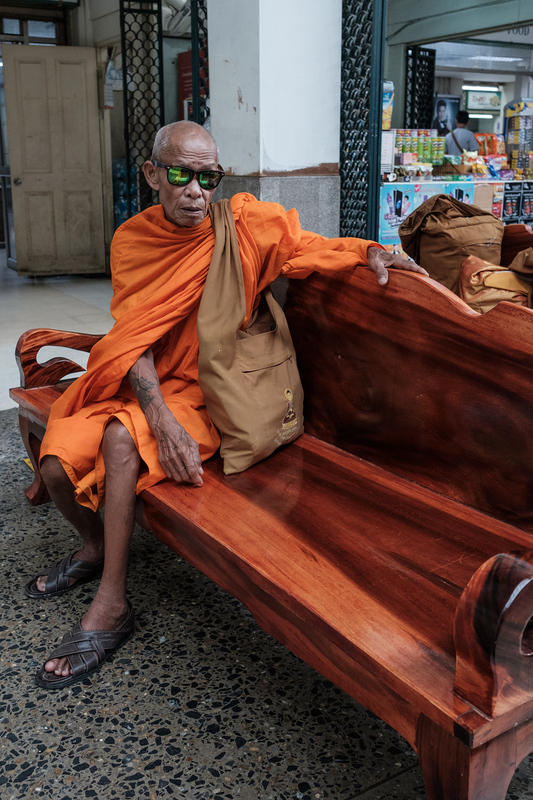 Please check out the following two galleries for my best Colour and Black and White Street Photography. As a Street Photographer, I'm often asked what gear I use the most when I go hunting on the streets... Till a few months ago, my go-to lens was the Fujifilm XF 35mm f2 lens paired with a X-T1/2, giving it a 50mm equivalent focal length. While famous Street Photographers like Henri Cartier-Bresson, preferred the 50mm on their film cameras, I sometimes like to come in a little closer, although there is definitively a place for both! 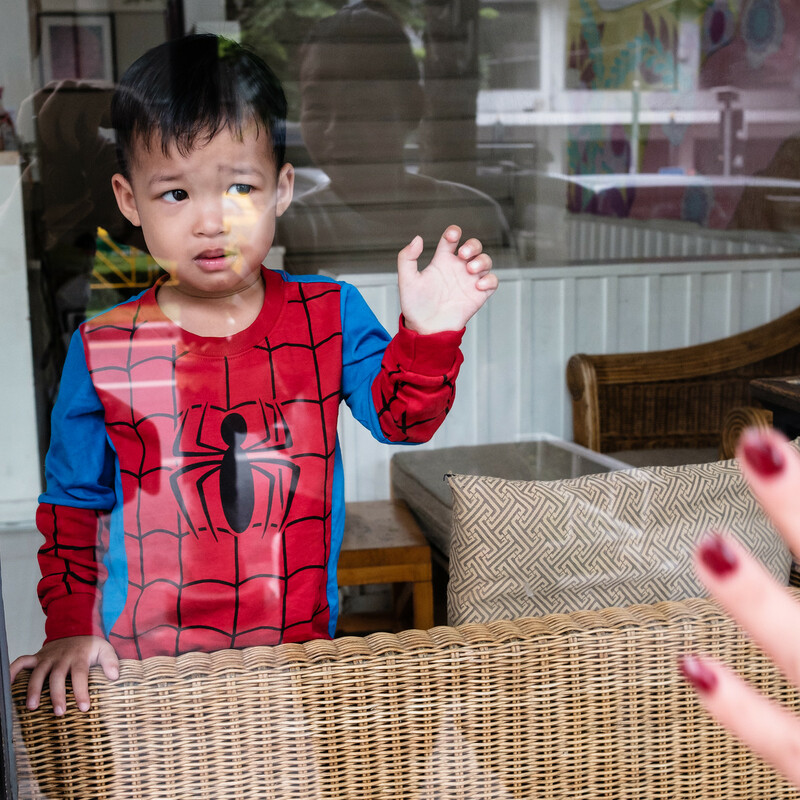 So, before I left for a short layover in Bangkok last week, I decided to only take my two favourite primes; grabbing my trusty 35mm f2 and the brand-new 23mm f2. Together with my X-T2 , they would make for a great Street Photography set-up! 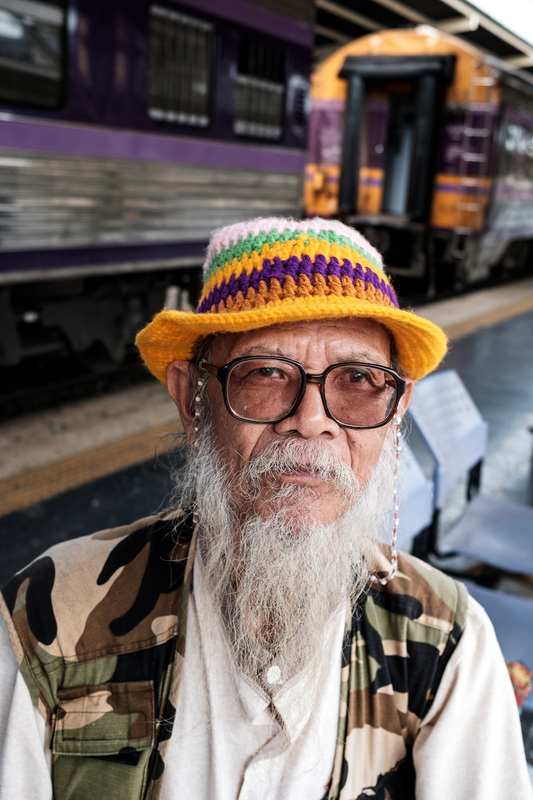 First stop, was the main Bangkok railway station! 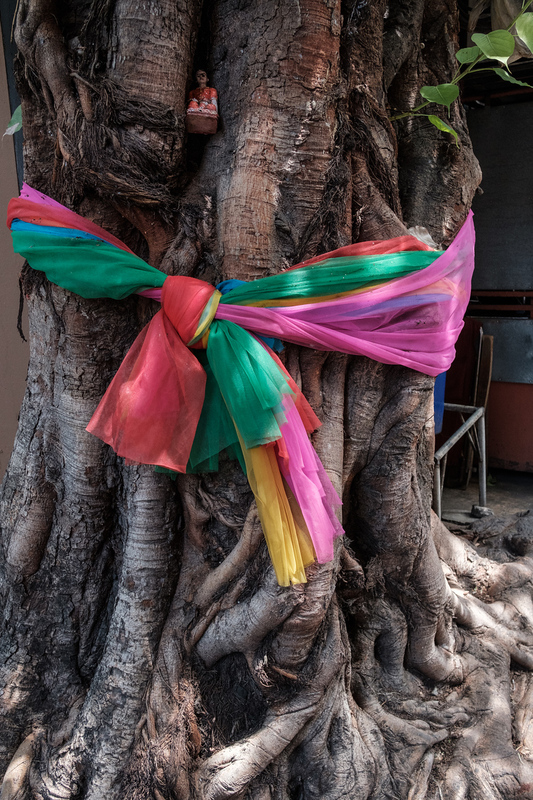 It was Thai street photographer Rammy Narula, who just like myself, appeared on the Valerie's Jardin Street Focus podcast, that inspired me to visit the place. 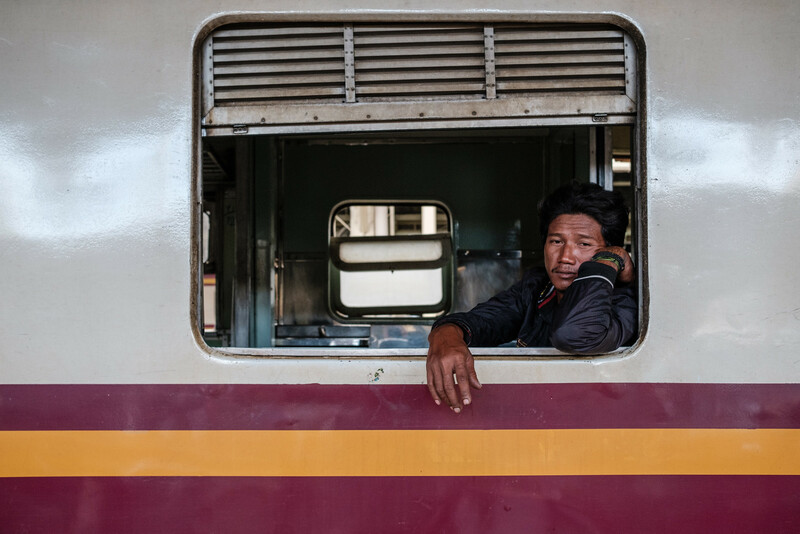 Rammy has published a photography book (Platform 10 - click here for more) with some amazing images all shot on Platform 10 of the station. Made over more than a hundred visits, the photos were all taken in the same 20 min block where the light was at its best and are very moody and Noir. 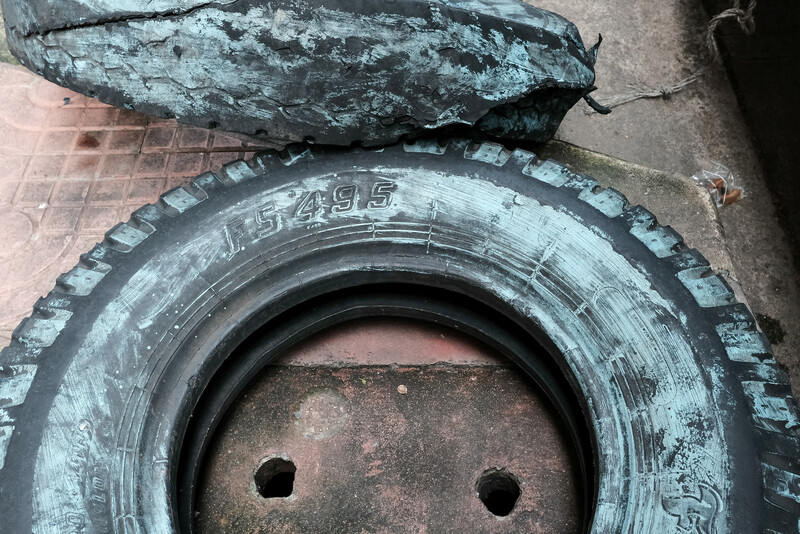 Valerie on the other hand has just set-up her own new podcast, called "Hit the Streets"; if you are not subscribed yet, make sure you do so here. Although, I wasn't there when the light was at its best, I did enjoy my visit and will likely be back! 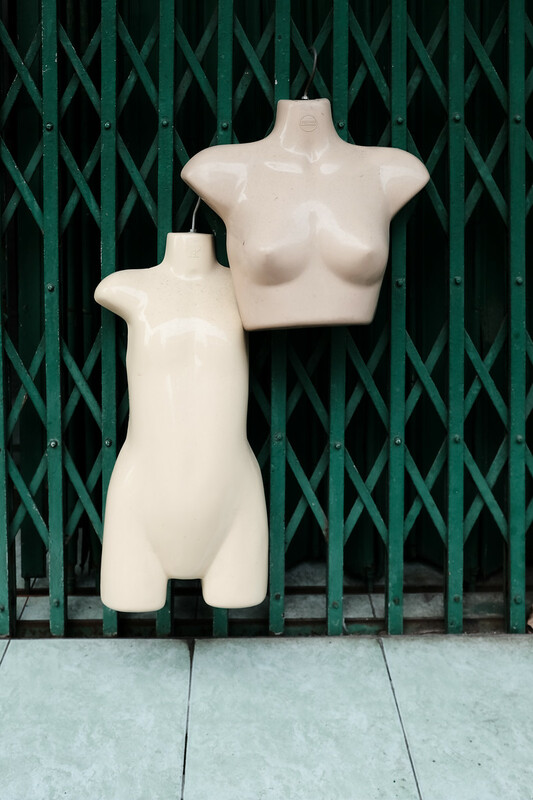 or a couple of mannequins hanging on a fence; both made me smile! 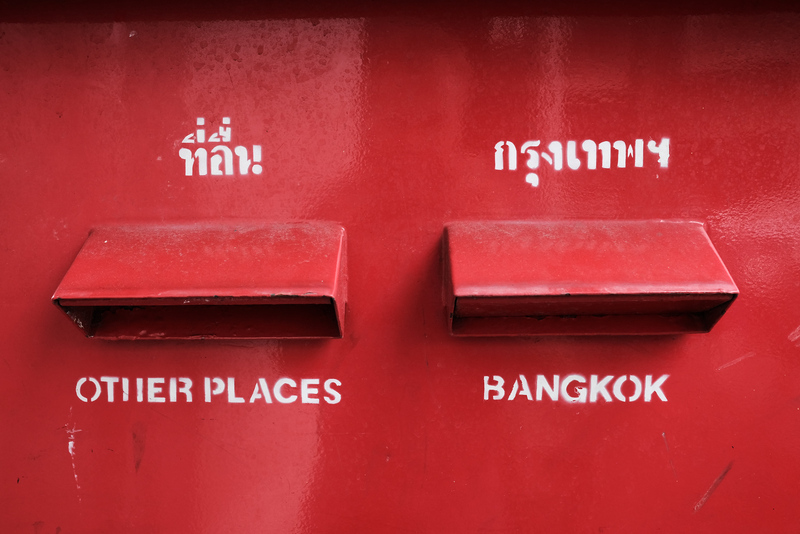 Bangkok (Thailand) might not be the first place that comes to mind when picking a city to do Street Photography, but it is definitively full of opportunities! To come back to the 23mm f2 lens; since I didn't even take the 35mm out of the bag, it looks like it will become my new favourite lens for Street Photography. In case you missed my "First Look review" on the release day, please click here. Lastly all of the images were shot using the Fujifilm Classic Chrome Film Simulation mode on the Fujifilm X-T2 camera. To all the Thai people, my sincere condolences for the loss of your King on October 13, 2016. Now "Hit the Streets" and have a great weekend! Whenever I go to a place like Hong Kong, I enjoy going off the beaten path; sure going to the evening light-show in Kowloon or taking those "aerial" shots from The Peak, is cool, but there is more. On my last visit I went to Quarry Bay; a large residential area in the Eastern district of Hong Kong Island; formerly known as Lai Chi. Although there is a fair number of modern architecture in that part of the megapolis, I mainly went there for some of the older run down, pastel coloured apartment buildings. Unfortunately I wasn't able to stay in the area till after sunset, but one day I would like to return and shoot a similar image during the blue hour; I can already see all of the lights in the individual apartments adding to the overall atmosphere. 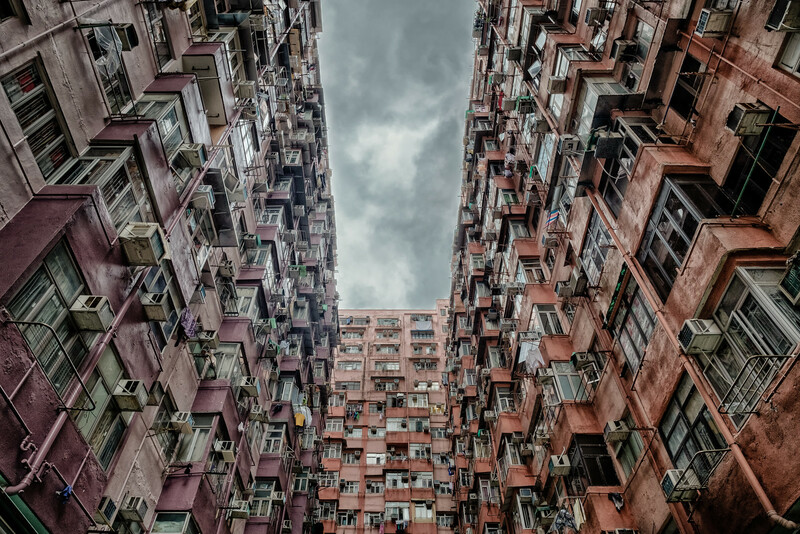 Take Kayo, from the famous "BigheadTaco" photography YouTube channel, has just written a great article for the October edition of the FujiLove Magazine, titled "Hong Kong Concrete Landscape". If you are shooting X-series cameras or interested in the system, make sure you subscribe to the great FujiLove magazine here. For a small fee (25DK/3.5EUR) one can visit the Rundertaarn, which I would definitively recommend especially for photographers. Although the observation deck has some great views over the old part of Copenhagen, it is especially the climb to the top that makes it interesting. Instead of stairs, a 7.5 turn cobble stone spiral ramp brings one to the top. Something that was done to allow horse carriages to bring heavy equipment and books to the observatory. Depending on the weather and the moment of the day, the light through the side windows can make for some pretty dramatic images. Although I framed quite a number of images along the ramp, the one that stood out to me was the image below. 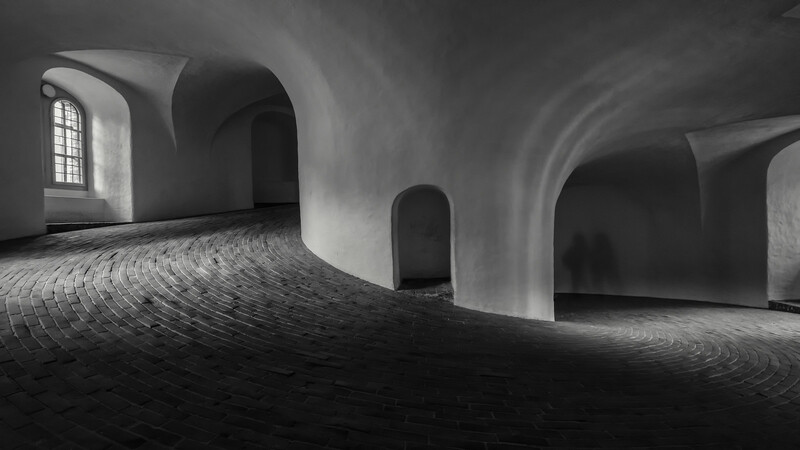 In the right hand part of the image, a couple casting a shadow on the wall and the structure of the arch on the right make it all that much interesting. The latter look like veins in an arm to me. More work of the capital of Denmark, can be found here. 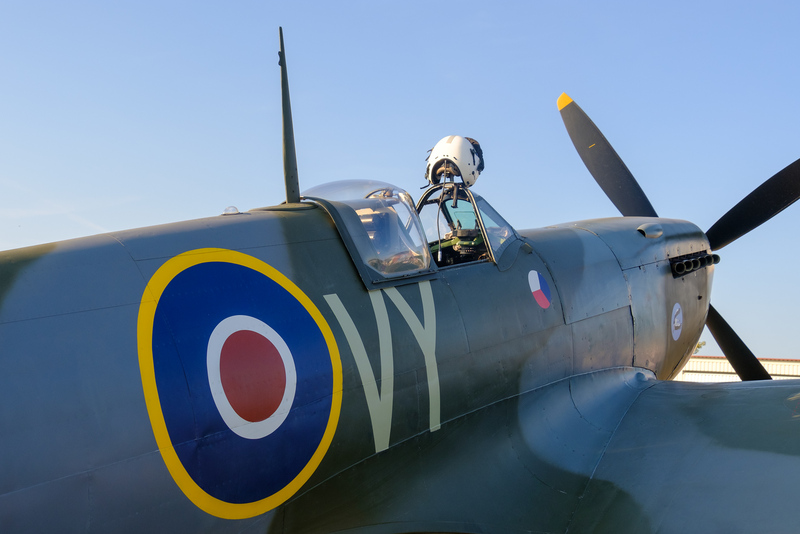 As an Aviation photographer, I can often be found at one of the many airshows around the world. Although I have attended some of them multiple times, a few remain special! 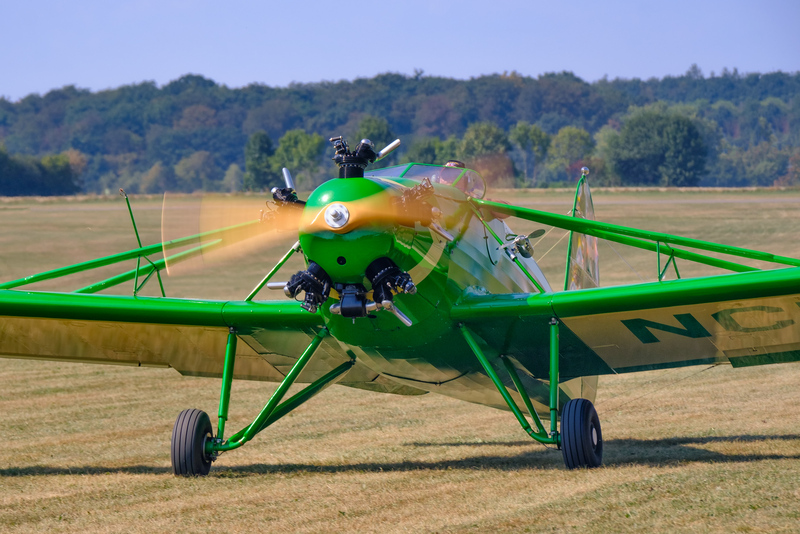 Airventure (The Worlds Largest Airshow in Oshkosh, WI), Shuttleworth (Old Warden, UK), Sun 'n Fun (FL), La Ferté Alais near Paris and last but not least, The Oldtimer Fliegertreffen at the Hahnweide grass airstrip near Stuttgart, Germany; all of them have a special place in my Aviator heart. 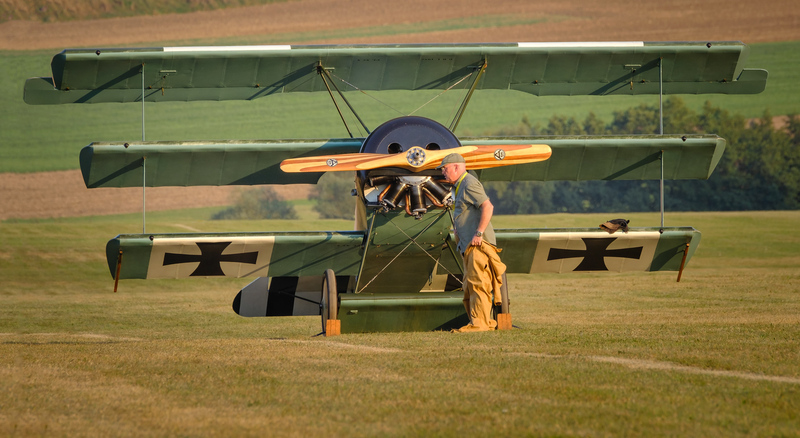 After I attended The Oldtimer Fliegertreffen (OTT) for the first time in 2013, I knew I would be back! The two yearly event was unfortunately not held last year, but did take place from the 9th till 11th of September this year! 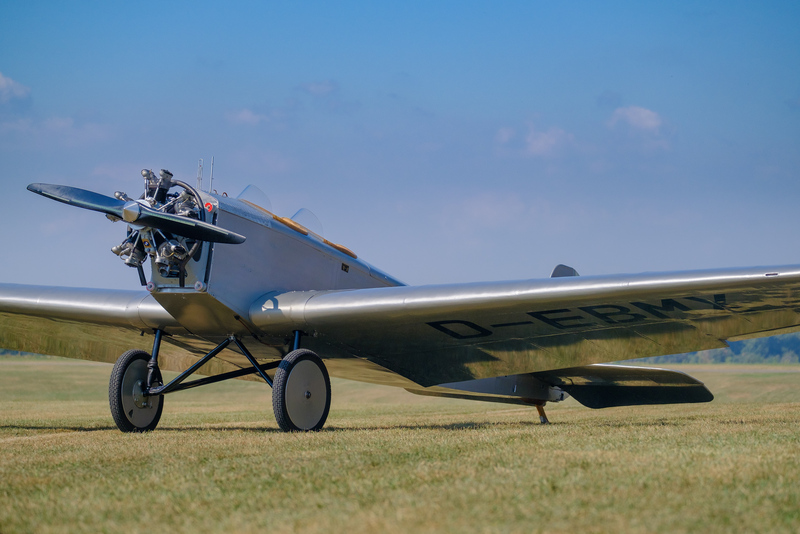 Unlike a lot of other "Oldtimer Fly-ins", this one bans aircraft younger than 40 years from landing at Hahnweide (with a few exceptions). 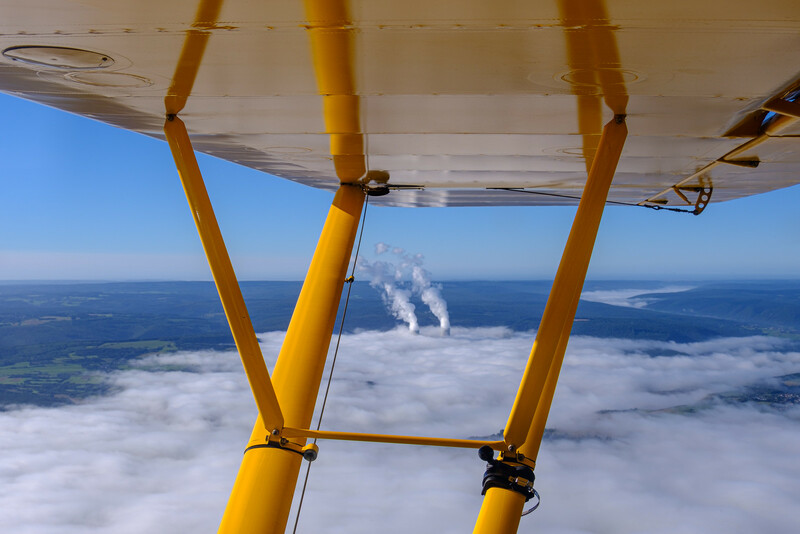 More than 300 historic airplanes found their way to the OTT this year, with the furthest one coming all the way from Madrid, (Spain), father and son Jose Luis Olias, flew 25 hour total to attend OTT. 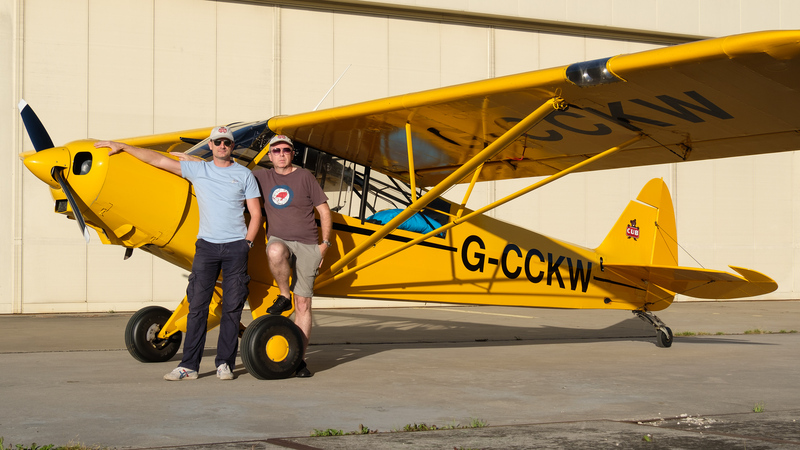 Rather than driving in, this year we flew our 62 year old Piper Super Cub (L-21B) from Belgium to the small airstrip in southern Germany and decided to camp with the aircraft. Something that is probably on the bucket list of a lot of fellow aviators! The 4 hour flight took us across the southern part of Belgium (The Ardennes), Luxemburg, the Rhine Valley and eventually just North of Stuttgart. Beside bringing camping gear for two, I obviously also carried my latest photo-gear; the brand-new Fujifilm X-T2, XF10-24, XF18-135, 1.4 TC, and last but not least the amazing XF100-400 super telephoto lens. Given, there would be no real place to charge my batteries, I ended up bringing 6 batteries, which turned out to be just right for the three day stay. Since we didn't have the space to bring a laptop, I also brought plenty of memory cards. 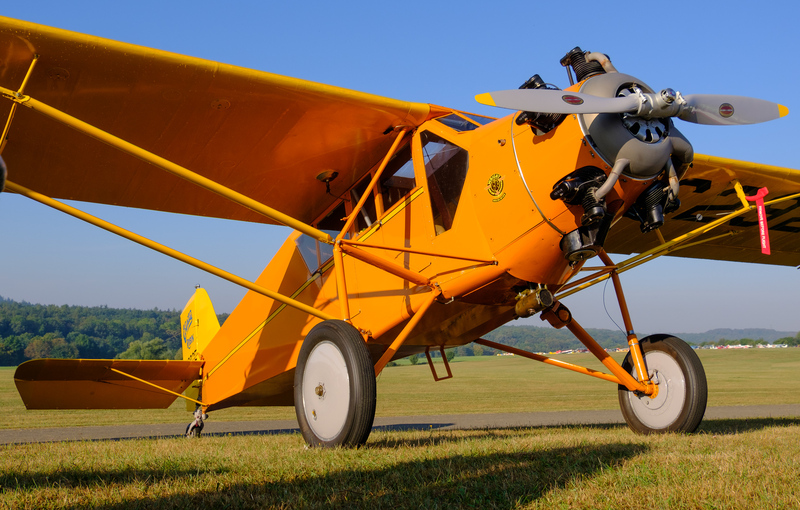 Swedish pilot Mikael Carlson and owner of the Flying Machines collection, has been bringing some of his collection aircraft to the show since 1991, making him one of the icons of the show. 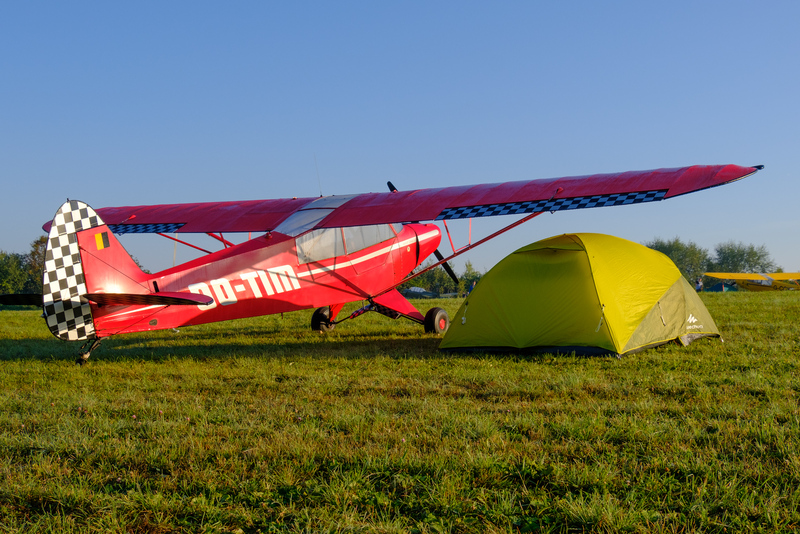 Just like previous years, he transported one of his two Blériot XI's all the way from Sweden for the show; a 3000 km road trip for three short 10 min hops! Hats off Mikael! 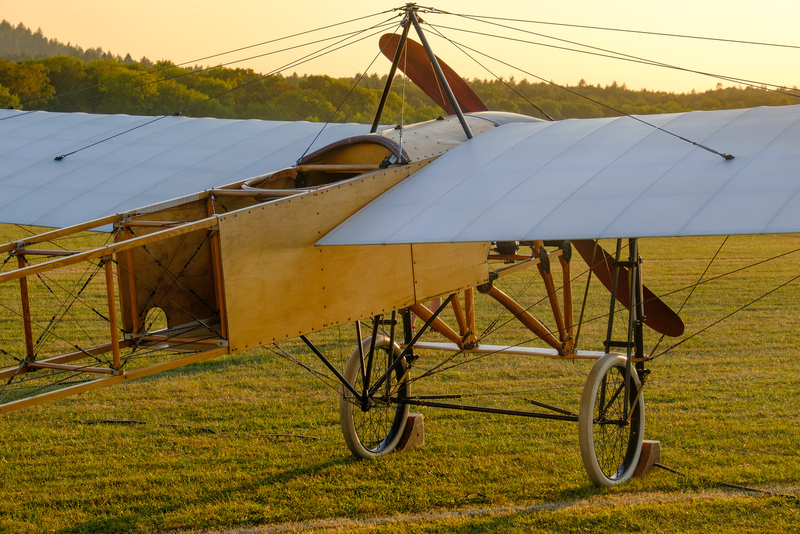 The Blériot flown by Louis Blériot was the first aircraft to cross the English channel in 1909 and Mikael flew one of his own across to celebrate the 100th anniversary of the crossing; quite an achievement! 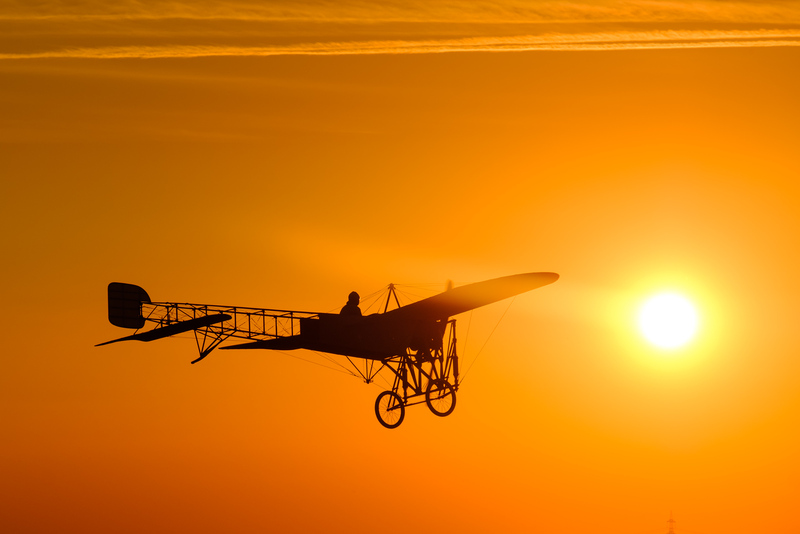 Like previous years, Mikael flew the Blériot XI just before sunset on Friday night; once again a very memorable moment. Like previous years he brought a second plane to the show. 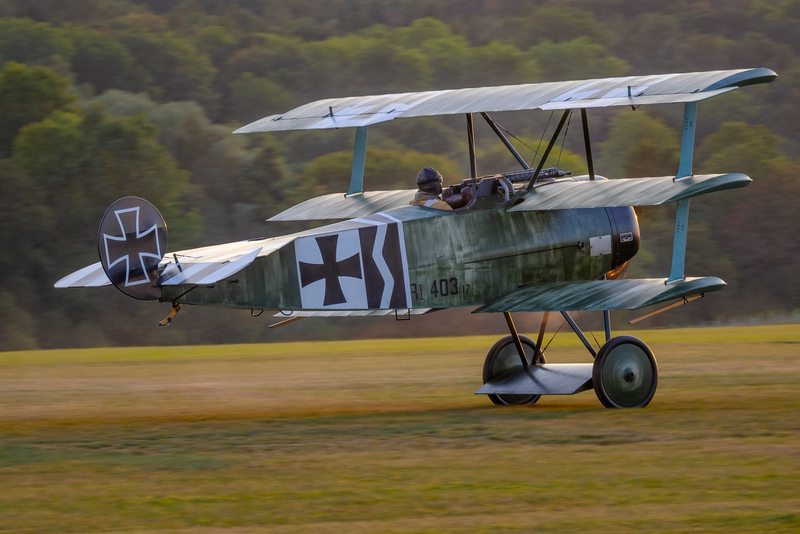 This year however, he allowed the public to vote online for their preferred plane and it became the WWI Fokker Dr I "Dreidecker". 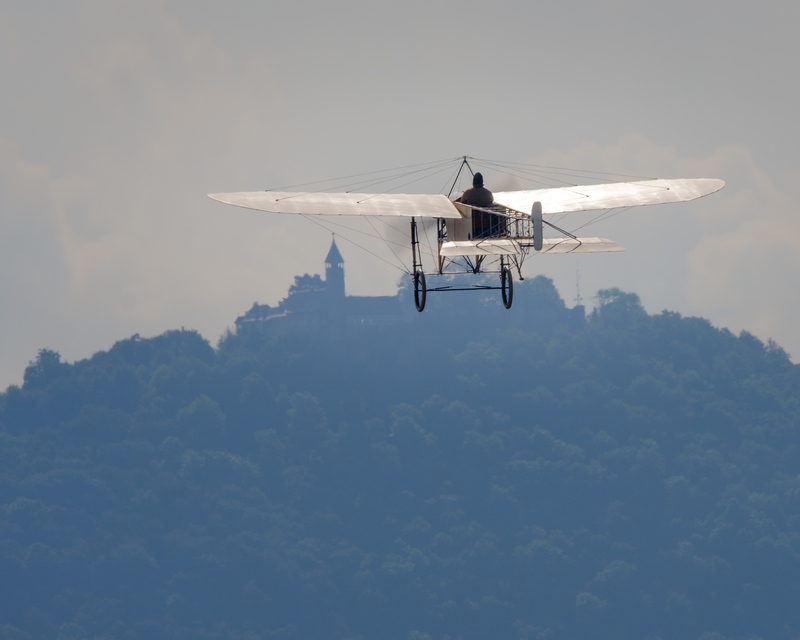 This triplane was the type flown by famous German WWI ace Manfred Von Richthofen; nicknamed the Red Barron. Pic(k) of the week 39, was devoted to this airplane. 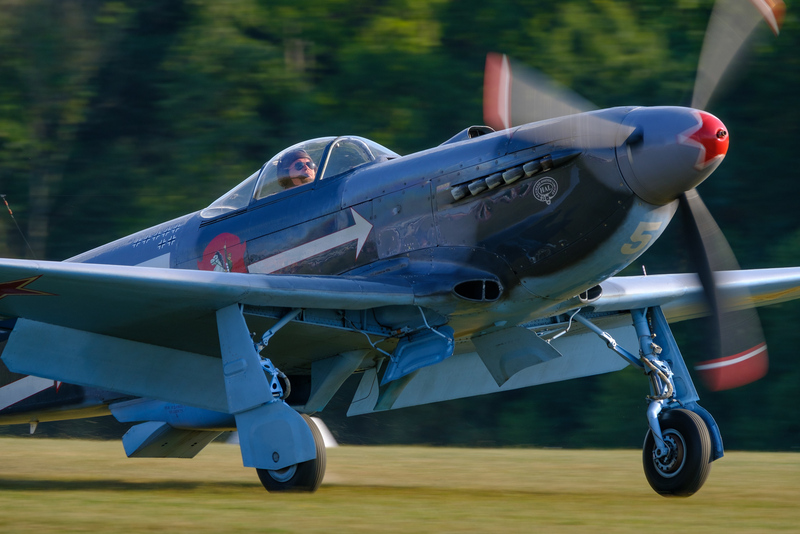 Yes, there was a Spitfire, Hurricane, P-51 Mustang, P-40, Skyraider and even some Russian Yak's on the grounds, but what makes the show unique are the rare birds of which sometimes less than a handful in the world are in still flying condition. Staying on the show grounds allowed me to photograph pretty much non-stop from sunrise till well after sunset. 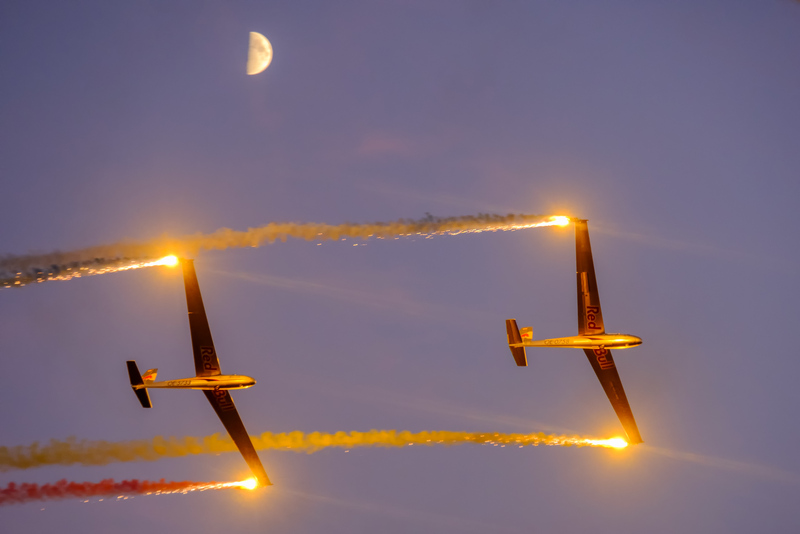 On Saturdays and Sundays, the OTT has an interesting evening/night airshow; not with military jets screaming through the evening skies, but rather one with acts such as a pair of gliders performing aerobatics synchronised to the music. Shooting night airshows is not easy, as one obviously can't use a tripod in these dim lighting conditions; a camera that shoots at ISO 6400 and higher without noise is a must! Thanks Fujifilm. 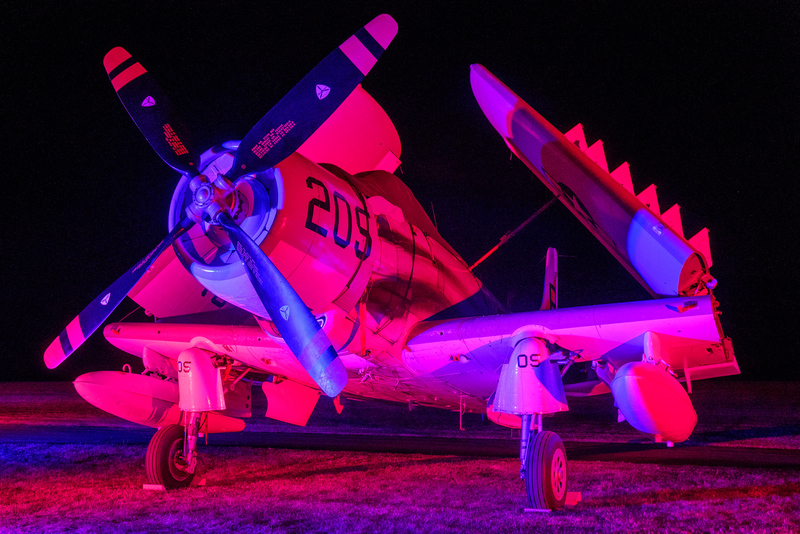 As part of a light and sound show avery night, the flight-line is lit by artificial light; making for some interesting images. 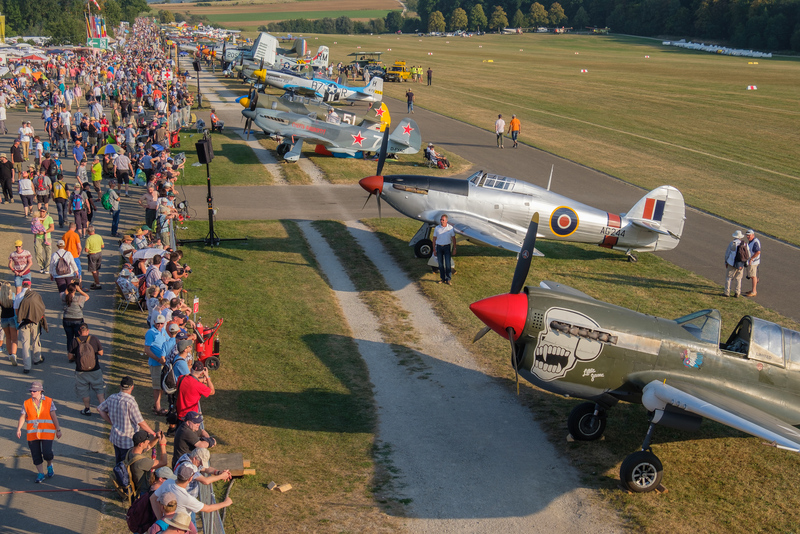 Overall the Oldtimer Fliegertreffen, is pretty good for aviation photography; especially if one can obtain a flight-line access pass; either through the media credential channel or through flying in yourself. Unfortunately the runway is orientated NW/SE, so that one is facing into the sun for a large part of the day. The great background of the surrounding forest however compensates for that. A nearby castle can often be seen in the background of some of the images; given them that typical iconic Hahnweide look. With once again over 35.000 visitors spread over the three days in perfect blue skies, the 2016 OTT was a huge success. I hereby would like to thank the +500 volunteers who every two years make this event possible! Vielen Dank! All images are shot with the Fujifilm X-T2. The complete collection of the 2016 OTT can be found here.